Thomas Wolsey was the last, and perhaps the most powerful, of the great mediaeval prelates to hold high office in England.He was famous for his administrative ability, his skill in foreign affairs and his closeness to his master, Henry VIII. He was also notorious for pride, arrogance and acquisitiveness. In the mediaeval period, almost the only way a man who was not born into the gentry class, or above, could rise to a position of influence, was through the Church, which, at that time, was more meritocratic than the secular world. Clever boys, taught at the local monastery schools for modest fees, could be given scholarships at the universities, and provided they worked hard, and were willing to enter the priesthood, become officials for either the nobility, or the King's Government. In an age when scholarship was considered beneath the dignity of nobles, it was useful to have low-born men to perform administrative tasks. Thomas Wolsey was born to a substantial butcher and grazier in Ipswich and attended the monastery school there before going to Magdalen College Oxford. Exceptionally intelligent, he graduated aged just fifteen and was ordained priest in 1498. His initial entry on to the world stage was as tutor to the sons of Thomas Grey, Marquess of Dorset, half-brother of Queen Elizabeth of York. He then became a member of the household of Henry Dean, Archbishop of Canterbury, and was part of the diplomatic mission that arranged the marriage of Margaret, daughter of Henry VII, to James IV of Scotland. Following a period in the service of Sir Richard Nanfan, Governor of Calais, he entered the service of Henry VII in 1507 as Royal Chaplain, and secretary to Bishop Foxe, Lord Privy Seal. Wolsey was appointed Almoner to Henry VIII in 1509 and began a rapid climb to power, following Bainbridge as Archbishop of York from 1514, Lord Chancellor and then Cardinal. Wolsey was not just Henry VIII's Lord Chancellor, he also had a warm personal relationship with the King, although he was never popular with Queen Katharine or the members of the nobility who considered him arrogant and proud. 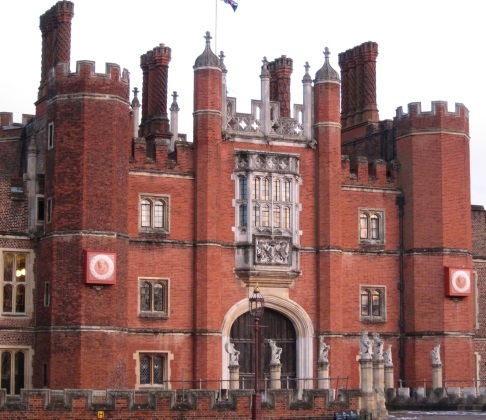 Wolsey lived in spectacular style, creating the masterpiece Hampton Court from a small manor house. His wealth and magnificence were the source of much envy and the subject of biting satire. He was an important figure in European politics, working with Henry to maintain a foreign policy that would enhance the prestige of England with the other European princes. His finest moment was probably the organisation of the Field of Cloth of Gold and he seems to have favoured alliance with France generally, which may have contributed to Katharine of Aragon's dislike of him. Wolsey was tolerant in religious matters, and tried to introduce some measures of reform in the Church. He also instituted the suppression of some monasteries to divert funds to his great Oxford college, now Christ Church College. Wolsey had a vast entourage of priests, lawyers, secretaries, and other hangers – many of the men who went on to serve the King, such as Thomas Cromwell, Stephen Gardiner, Richard Rich, Thomas Wriothesley and so on were part of Wolsey's household. Wolsey's failure to obtain an annulment of Henry's first marriage, despite trying every possible stratagem he could envisage, and the personal animosity of Anne Boleyn, who blamed him for breaking up her relationship with Henry Percy, later Earl of Northumberland, led to his catastrophic fall from power in 1529. He eventually retreated to his Archbishopric of York but found it difficult to take a back seat and tried to recover his position through intriguing with the Emperor. Despite some dithering by Henry, who was fond of Wolsey and had reason to be grateful for his many years of service, he never regained influence, and in 1530 was accused of treason, dying en route to London.